Targeting precision with spray wand! It wears many hats. From killing pests to removing wallpaper, it has your back. With an extra-long wand to make sure you spray only the area you want, you can't screw it up. Simply put your liquid of choice in the 4-gallon container using the extra-large fill opening, and off you go. Your liquid is sealed in tight with VitonTM seals and gaskets and is propelled forward thanks to the powerful piston pump. Whether you're right or left handed, you'll find numerous uses for this sprayer. Get your to-do list done. Order yours today! 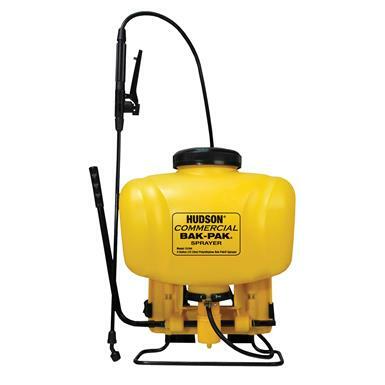 H. D. Hudson Commercial Bak-Pak 4 Gallon Sprayer is rated 4.5 out of 5 by 4. Rated 5 out of 5 by CoyoteHunter from Well built Comes with 3 extra different nozzles; even replacement parts for the most used O-Rings and seals. Did a test with just water and seems like it will work great. Going to use it at my cabin this weekend. Rated 3 out of 5 by Ronnie from good but no ajustable tip The item itself is OK BUT only broad light spray tips. NO adjustable tip so this really limits its use. Not sure if company has a adjustable tip for spraying. Not good for ranch use or most general uses except LIGHT spray. The rest is OK but sad to say it is a POOR product without a courser tip. Rated 5 out of 5 by Todd from Quality product After removing from the box and putting it together, I realized how well built this product was. It has tough rugged plastic tank and the wand mechanism is top notch. I can't wait to get outside and use it. Rated 5 out of 5 by pick from Good Product Did a great job, however the straps could have been better. Ready to defend your turf. 2 quality sprayers, one low price. 22.5" x 16.5" x 14". 14 lbs. Stop the pain, start the growing. Spray a swath of destruction through worrisome weeds.